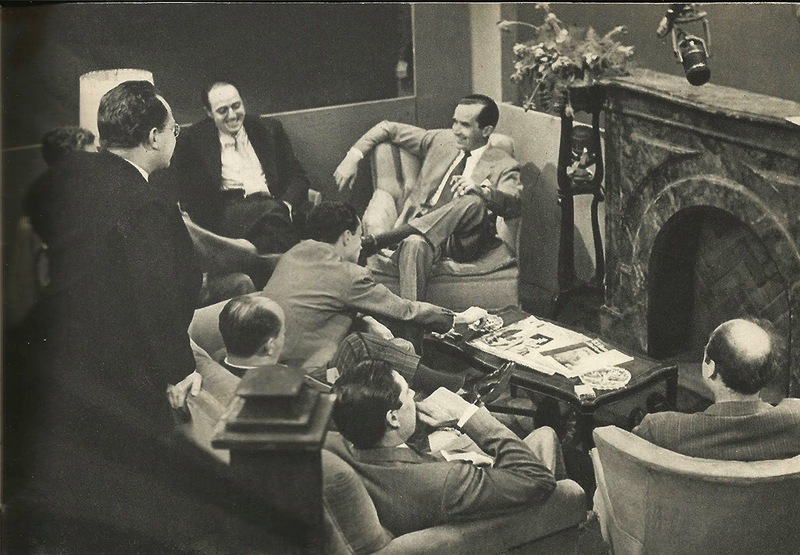 Edward R. Murrow and some of the Murrow Boys in 1950. Bill Downs is standing on the far left. From Pageant, June 1956. "What Foreigners Think About Us," pages 117-123. "Today, it's important to know how other countries feel about America. Especially in view of the import of international politics, foreign aid, threat of war and, of course, the American overseas tourist. To find out how others see us, Pageant asked top CBS-TV and foreign correspondents in seven countries to interview the man in the foreign street on what he thinks about Americans. "Newsmen who held the mirror up for us were David F. Schoenbrun, Paris; Daniel Schorr, Moscow; Bill Downs, Rome; Howard K. Smith, London; Richard C. Hottelet, Bonn, Germany; Robert C. Pierpoint, Tokyo; Alexander Kendrick, Africa. "None of the correspondents knew what his fellow newsman in the country next door was saying—but wait till you read from their reports. It seems that everyone from Africans to Frenchmen has definite and similar opinions of Americans, their resources and their way of life." 1. What puzzles foreigners most about Americans? France: The French are most puzzled about Americans' attitude towards money; why, they ask me constantly, do you think Americans work so hard to earn money and work equally hard to spend it? Russia: Russians seem most puzzled about the decentralization of power in the U.S. For example, when told that President Eisenhower opposed racial discrimination, they ask why he doesn't ban it. When you explain that the President doesn't have dictatorial authority, they shake their heads uncomprehendingly. Italy: Our naïvete. As one of the biggest nations in the world the foreigner often expects us to act the part. They are puzzled when we make a major blooper in diplomacy or our foreign relations. Likewise, they are puzzled when we pay out billions of dollars in foreign aid and then don't ask for something in return. The result is that sometimes foreigners feel they must treat us as somewhat idiotic and spoiled children. Americans abroad usually fall into one of three categories—the "everything is better back in Podunk" type; the "Why don't these people learn to do it our way" type; the "Gosh, isn't this wonderful" type. Fortunately, the latter predominates. England: Haste. They wonder why Americans are always in a hurry. In Britain you get business done by writing letters and having them considered at some length, before a request is granted (interviews with salesmen, etc.). The American system is to do it by telephone, and do it immediately. In a world that has lasted so long, our fellow men do not understand the rush. Germany: The Germans tend to be puzzled by the American mixture of practical, hard-headed realism and buoyant, optimistic idealism. America still the country largely known as the land of the dollar, and Americans as shrewd businessmen. Yet the United States has been giving away money in vast quantities since the end of the war. Has this been sheer generosity, or has Washington had an ulterior motive? On a personal level, general American preference for the aristocracy strikes everyone as rather odd. Many Americans seem to gravitate toward the Graf (Count) or the Freiherr (Baron) or the the Fuerst (Prince) in a way that does not seem characteristic. Japan: Our treatment of racial minorities. Asians are well aware of our democratic ideals of freedom and equality, and they find it extremely difficult to rationalize this with the many unfortunate incidents which occur regarding racial minority groups in America. It is hard for them to understand how a nation, which so loudly preaches democracy, can at the same time tolerate an Emmett Till case. Unfortunately, the progress made in America toward racial equality is not well advertised in Asia. Africa: Why there are so many of them wandering all over the place without any real reason except to seek enjoyment, when everybody knows the United States is the home of all enjoyment. 2. What disappoints them most about Americans? France: What disappoints the French most about Americans is to find that we are not all millionaires. They are shocked by middle-class, low budget tourists, who complain about prices in Paris. Russia: What disappoints Russians most about Americans (the few Americans they've seen) is our refusal to acknowledge the superiority of their system...and especially the fact that American workers say they like capitalism, flourish under it and are not oppressed by it. Italy: Our fallibility. America's tradition, particularly in the minds of Italians, is that it truly is "the promised land." They have relatives in the U.S. that prove it. This reputation, plus a good coating of Hollywood fairy stories, makes every short-coming or failure doubly significant in their judgment. For example, one never hears of the bastards that must have been left by the German army during its stay in Italy. But one would think the orphanages were all full of American illegal progeny. England: The joy Americans take in traveling several thousand miles to Europe and meeting other Americans in the lobby of the American Express Company. Europeans often complain that the thrill seems the greater, the nearer neighbors they find themselves to be. Germany: Those Germans who are disappointed with Americans—and they're a pretty small minority—don't like what they consider to be the American's childish manners, loud voices and loud neckties, colorful clothing (especially sports shirts). Americans do tend to have a lot of money by local standards, and sometimes throw it around a bit demonstratively. Japan: Recently Asians have been acutely disappointed by America on two issues. First of all, we seem to have abandoned our traditional anti-colonialism for the expediency of tacitly supporting our colonial European allies. 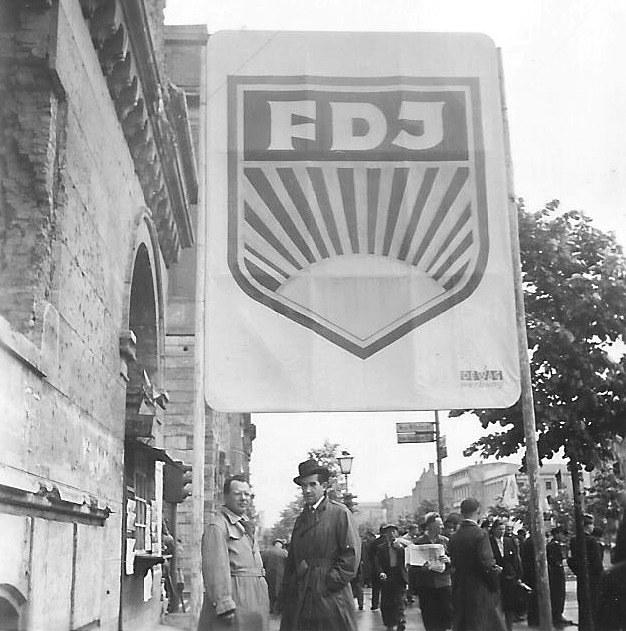 Secondly, we have rather clumsily continued to emphasize military strength and the military defenses of the free world while the Communists have more nimbly switched their attacks to the economic and political fronts. Most Asians feel disappointed that we have not more readily responded to the Communist challenge in these new areas. Africa: That they're not all rich, as expected. 3. What do they like best about Americans? France: The French love the youthfulness of Americans, American enthusiasm, yes, even our naïvete, which they find personally charming, if politically frightening. Russia: What Russians like best about Americans is our breeziness, informality, our ability to form quick friendships and enthusiasms. On the personal level, they frequently find more in common with Americans than Europeans. Especially after a little vodka. Italy: Our idealism. This is expressed not only in the fact that the new Italian Republic copied the form of our government—but it is expressed in simpler terms. Europe, generally, and Italy in particular, has never quite gotten over the aristocratic tradition and acceptance of special privilege. Family name, occupation and education still tend to stratify population. They admire the GI sergeant who speaks with ease to his officers. But underneath, the thing most admired in Americans is the American precept that one man is as good as another. This is expressed in the vote and in everyday relationships. And it is in this precept that democracy finds its greatest argument against totalitarianism. England: The geniality of Americans. In most cases American visitors to Europe seem to do their utmost to maintain a friendly attitude. Germany: The most likable thing about Americans is their friendly and unconventional manner. One German says: "Americans are frank, they are not prejudiced." The average American has won himself many friends in Germany by his fresh, open approach to life. Japan: We are an open and sincerely friendly people. While some of the more reserved Asians may not respond immediately to the back-slapping type of friendliness, most Asians find the Americans have a genuine interest in the welfare of other people. Africa: Their informality and lack of snobbism. 4. What do they think of American women? France: They find American women to be the most beautiful and dullest women in the world: beautiful from the purely physical point of view, the beauty of good health, good looks. However, they find American women conformist; they all look, talk, and dress alike. The tourist with her flat-heeled shoes, bright-colored raincoat, shoulder bag with a brass eagle has become the symbol of the American women for the French. Russia: Russian women tend to be envious of the well-groomed, well-dressed appearance of American women, the long fingernails and other evidences that American women don't work as hard as Soviet women. This envy is sometimes concealed behind ridicule. Italy: Pampered. In Italy, particularly, the woman is still something of her husband's personal chattel. And the Italian women are a bit frightened by the power the U.S. housewife wields in family affairs. They are also somewhat scornful of the efficiency of American women in their antiseptic methods of raising their child or even bearing them. England: They find Americans healthy, pretty and well-tailored, but complain that, as Westerners say of the Chinese, it's hard to tell one from another. Germany: "Die Amerikanerin," the American woman, is regarded in Germany mainly with envy. She is regarded as fully emancipated, and German women would like to enjoy a measure of her independence. But Germans feel that the American woman has bought independence at the price of femininity. She may be a good comrade, but she is taken as lacking in the tenderness and devotion which Europeans consider a woman's greatest charm. Japan: Perhaps my answer is colored by the personal prejudices of an American bachelor, who finds foreign women eminently attractive, but here goes. American women are considered to be very well dressed, quite attractive, and cold. Probably the most telling criticism is that they are not really very womanly. Most foreign men find them somewhat frightening. Africa: Their main experience being with American women in American movies, they love 'em all. 5. What do they think of young people in America? France: The French don't know young people in America. What they think about them, therefore, is based upon what they read in the papers, as reported from America, or in the movies from America. This has led the French to conclude that American youngsters are dope-fiends, juvenile delinquents, rapists, and gang-muggers. Russia: They have no special thoughts about young people in America, having seen practically none of them. Italy: They don't know much about young people in America except what they get from Hollywood or from the sensational stories in the press. They have nothing but admiration for students who come to study in their countries. Generally, this student group is the hardest working, most serious and nicest group of Americans abroad. The State Department should give them yearly bonuses. England: Foreigners have less contact with American young people than with other grades of Americans. Yet, it is the American teen-ager who has had the greatest apparent influence on foreigners. Probably Hollywood has been carrier of the teen-age cult abroad. In many places dungarees are standard wear for youth. Elizabeth Taylor and Tony Curtis hairdos are very prevalent among European teen-agers as are swoon sessions for visiting American crooners. Germany: American children and teen-agers in general are judged mainly by the young Americans stationed in Germany with military families. They are thought to be overly self-confident, and to exercise their great personal freedom a bit too violently. Germans feel that American children tend to dominate their families, thereby hurting both themselves and their parents. Japan: American young people are generally considered by foreigners to be friendly, undereducated, and oversexed. Asians are sometimes shocked and frequently fascinated by the freedom of association between boys and girls in America. Words like "necking" and "petting" scarcely exist in Asian vocabularies. Sometimes foreigners appear to be surprised at how well Americans turn out, considering the poor start they get as young people. This is no doubt evidence that their views of American youth are too harsh, colored by reports of American juvenile delinquency. Africa: Every student in Africa who can go to an overseas university is not choosing America instead of Britain, as before. 6. What was the most unexpected thing you found in a foreign country that bespoke American influence? France: A hot-dog stand recently opened on the Boulevard de la Madeleine in Paris, in front of the Olympia Music Hall with a big sign "Hot Dogs" printed in English. A self-service restaurant on the Champs Elysees, specializing in chicken-on-the-spit; garish, Miami-Beach style sport shirts at the Bou Saada oasis in southern Algeria; a huge road sign at a camel caravan crossing in the Moroccan Atlas Mountains, saying, in English: Death is so permanent...Slow Down...U.S. Air Force. Russia: The most unexpected evidence of American influence I found in the Soviet Union was the American machinery used in the Stalin Auto plant in Moscow—lend-lease equipment is still in use. Italy: Canned American spaghetti, imported from New Jersey. It showed up in a fancy Rome food shop. England: The ubiquity of the American famous soft drink. In strife-torn Cyprus I was amazed to find that all the spots where riots most often occur had been emblazoned with large advertisements for that commodity. For example, on Metaxas Square in Nicosia, four vantage points were occupied by signs. This ensured that every time trouble broke out—which is often—photographers unwittingly propagated the pause that refreshes. Germany: Perhaps the most incongruous American import in the land of Beethoven, Bach, Brahms and Wagner is the jukebox. Japan: After living eight years abroad, I am still constantly amused and amazed by the widespread influence of American music. I don't suppose I shall ever quite recover from the first time I saw a Geisha clad in the dignified costume dancing a jitterbug. Africa: Crossing the Equator in Kenya, British East Africa, a sign which read "Equator, 8600 feet altitude, Drink Pepsi-Cola." 7. What American product would a foreigner like to own? Russia: The American product a Russian would like most to own is an American car—judging by the disbelief they express at the lower price. (A car comparable to a 1941 Ford costs $4,000 in Russia). When an American car parks in Moscow it draws a crowd. Italy: If you leave out dollar bills and immigration visas, my guess for Italy would be washing machines. The number of women-hours spend in boiling, scrubbing, rinsing and drying laundry throughout Italy runs into the tens of millions. England: After considering and rejecting Cadillacs (too expensive for Britons to run) and washing machines (no longer an American monopoly) I nominate the combined domestic refrigerator with deep-freeze unit. Britons go into ecstasies over this topic. Germany: The housewife would most like a dishwasher or an automatic ironer. One journalist nominated a pocket size stapler. Japan: The desire to own an American automobile is practically universal. It covers both sexes, all age groups, and transcends all national boundaries. The only possible objection would be against some of the new pastel colors, and most foreigners admit they could even get used to these if they could just afford the car. Africa: A red automobile, preferably a taxicab. In the late summer of 1942, when Larry LeSueur was becoming tired and frustrated after a year of covering the eastern front, Murrow began looking for someone to replace him in Moscow. Collingwood said they needed a "very good feature writer, someone to tell the anecdotes, give the flavor of life in wartime Russia, rather than just paraphrase communiqués." That, of course, was a backhanded slap at LeSueur. (As generous and charming as Charlie Collingwood was to most people throughout his life, he could be a devious competitor; this unfair little insult was just the first bud of what later became a full-flowered rivalry between him and LeSueur). Bill Downs, in UP's London bureau, was just the man for the job, Collingwood said. Downs did have a flair for feature writing, but he was above all a hard-nosed reporter, the kind who "got the story, got it first, got it right." He wore thick glasses with heavy frames. He was short and had an ample, powerful build, an abundance of dark hair, and a loud growl of a voice that when raised (as it often was) gave new meaning to the concept of wrath. But more than yelling, Downs loved to laugh. And drink. And tell stories. And argue. In roughly that order. He hated pomposity. When he first arrived in London, he entered a pub on Washington's Birthday and loudly proposed a toast to the man "who kicked the hell out of the English army one hundred and fifty years ago." Bill Downs also had a fierce sense of integrity and honor. Ed Murrow took to him instantly. Downs had grown up in Kansas City, and all he ever wanted to be was a reporter. His father, William Sr., was a Union Pacific railroad engineer, his mother a housewife with a third-grade education. During his father's long absences on the railroad, Bill—an only child for nine years, until his sister, Bonnie, came along—was doted on by his mother. The family was never very poor. When business fell off during the Depression, the Union Pacific cut back on Downs's runs, but he always kept his job. Even so, Bill Jr. was expected to help pay for his schooling: two years at Wyandotte College and two years at the University of Kansas. One of his summer jobs was as a grain sampler, testing the quality of the wheat before it went to market. Downs had to climb to the top of huge silos and dive down into the "damn dusty stuff" and come up with a pint of sample wheat. It was a dirty, hot, dangerous job, but it helped strengthen Downs's already powerful physique. Later it turned out to have had another advantage: it was the kind of hard youthful work that always appealed to Ed Murrow. In school Downs was sports editor of his high school newspaper and manager of the paper at Wyandotte College. At the University of Kansas, which he entered in 1933, he was according to a college friend, John Malone, "the best and most prolific writer and reporter in the whole university." In 1935 the campus paper, the Daily Kansan, went bankrupt. The next fall the newspaper's board appointed Malone publisher, and he in turn chose Downs as managing editor. Within a year the paper began to turn a profit, and it has operated successfully ever since. Malone gave most of the credit to the energetic, impatient Downs: "He was a great managing editor. He had the newsiest paper around, far better than the Kansas City papers." After college both Downs and Malone were hired by the UP for its Kansas City bureau, along with another Kansan (and recent University of Texas dropout) named Walter Cronkite. Downs was immediately tagged as a comer at UP. Within a few months, he was transferred to the Denver bureau and not long after that to New York. In 1941 he was given the wire service's plum assignment—the London bureau, the war. He loved the speed and immediacy of wire-service work, but when Murrow approached him about the CBS job in September 1942, Downs didn't hesitate. "Not only will it establish my name," he wrote to his parents, "but the work is easier and I believe has more future." Not to mention a seventy-dollar-a-week salary and an expense account. First, though, he was supposed to undergo the pro forma voice test. It did not go well. Even Murrow called it "terrible" and told Downs to try again. This time, Murrow said, just go to Piccadilly Circus and come back with a story describing what you saw. On his return, Downs talked about two GIs leaning against a wall, admiring the passing parade of women, most of them in slacks. Suddenly one of the soldiers spotted an American Red Cross worker in a skirt. "Look, Willie," he shouted. "Ankles." Downs's growling voice didn't improve in the second test, but Murrow loved the story so much that he hired him anyway. In November, after receiving a little radio training from Collingwood, Downs was deemed ready for Moscow. He set off, equipped with a new ankle-length, fur-lined leather coat and matching fur-lined flying boots for protection against the Russian winter. Although Downs found the assignment in Moscow no easier than LeSueur did, he managed to demonstrate that he was the equal of his seniors on the Murrow team. In late January 1943, after the Red Army's siege of Nazi-occupied Stalingrad had finally forced a German surrender there, Downs and several other American correspondents were taken to see the ruins. "Try and imagine," he told his listeners, "what four and a half months of the world's heaviest bombing would do to a city the size of Providence, Rhode Island, or Minneapolis or Oklahoma City." It was "utter and complete and absolute devastation." In a fifty-mile radius one could see only piles of bricks and rubble and corpses." Downs continued, "There are sights and smells and sounds in and around Stalingrad that make you want to weep and make you want to shout and make you just plain sick at your stomach." The portions in parenthesis were censored by Allied officials. The people of Britain have to depend on Axis radio nowadays to find out just what their Commandos are doing, and this morning the Berlin radio gave them an earful. The Berlin announcer revealed that there have been at least four raids on the Occupied coast of Europe since the first of September. 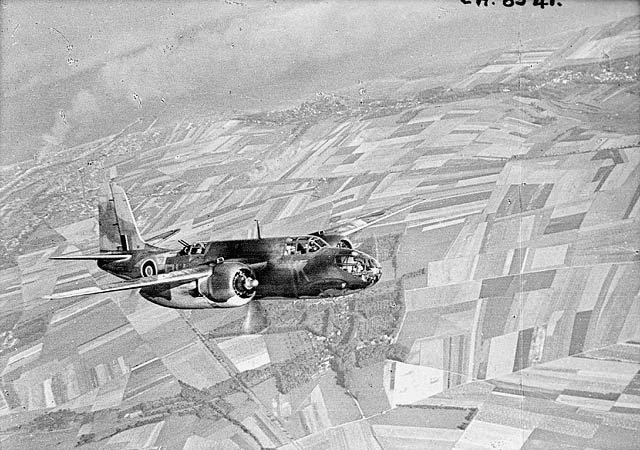 The raids apparently were not large attacks—just small landing parties assigned to test the German defenses, take prisoners and get information out about military installations. It was these raids which led Adolf Hitler to order the chaining of the Dieppe prisoners. Apparently these small scale attacks must have been too successful for German comfort. 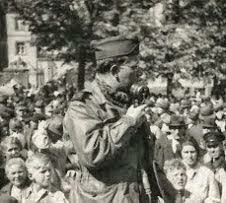 The German announcer said this latest series of Commando attacks were concentrated on the Normandy coastal region. The German announcer then made a statement which sounds mighty good to the British man-in-the-street whether it's true or not. The announcer said the Commando raids were in preparation for what he called "a major invasion of the coast of Normandy." You notice he didn't say "an attempted major invasion"—he said invasion. All in all, the stuff that has been pumped over the Axis controlled radio stations the past few weeks sounds pretty encouraging. Vichy is showing unprecedented concern about what is going on in North Africa. Only the other day Paris radio said American army contingents are "arriving daily" on the Gold Coast and in Liberia and the Belgian Congo as well as in South Africa. Goebbels formally declared that the Germans can soon expect a major Allied offensive in Egypt, and the people of France just the other morning were told to prepare for Allied air, sea and land activity and to keep away from military areas. In many ways, Germany today is in the same position which Britain found herself at the end of 1940. Germany has officially announced that she will be on the defensive this winter. Although this statement might be propaganda, most military experts believe it's true. (It appears that the time has at last arrived for the United Nations to reveal itself. How, where and when is a military secret—but it's a secret that must be causing great concern in Berlin and Rome). This morning's authoritative London Times, which often acts as the unofficial spokesman for the government, had this to say in its leading editorial discussing future strategy. (The Times said "The British Isles on the continent of Africa have stood siege for three years ?) . . . the time approaches for their Allied garrisons, along with the armies from the unreduced strongholds of Russia and China, to turn upon their assailant and carry the war into the heart of hostile lands."